Petrovsky Stadium formerly known as the Lenin Stadium between 1925-1992 is a sports stadium located in Saint Petersburg, Russia. 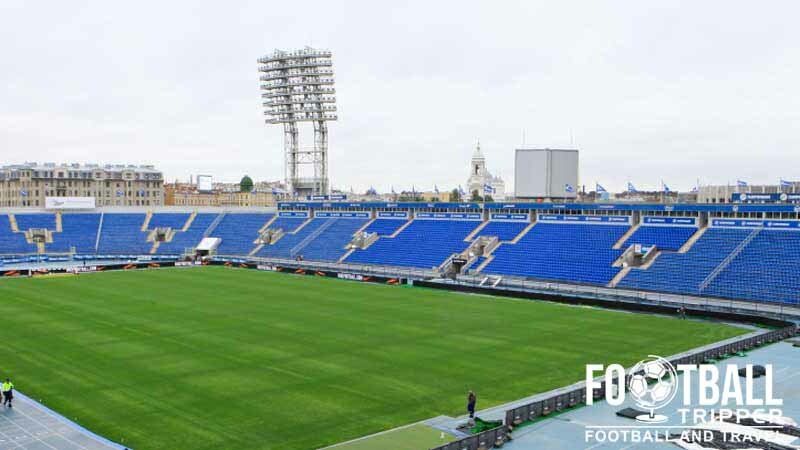 Situated within a wider sports complex on the banks of the Malaya Neva River, the ground is home to FC Zenit Saint Petersburg and it has a current capacity of 20,985. The Sports complex where Zenit Saint Petersburg’s stadium is located dates as far back as 1925 when Czech architect Aloise Wejwoda designed a stadium in honour of recently deceased Russian communist leader, Vladimir Lenin. Completely obliterated during World War II, it was rebuilt over a four year period between 1967 – 1961 with a capacity of 33,000 which was made up solely of seats – something which was unusual in Europe at the time. The 1980 Summer Olympics was held in the Soviet Union’s city of Moscow, and although the Petrovsky Stadium wasn’t directly involved, the entire stadium underwent a major renovation as a back up and additional source of national pride. The 1994 Goodwill games saw the Petrovsky stadium finally used for an Athletics competition with changes to the seating arrangements giving the ground its current 21,405 capacity today. 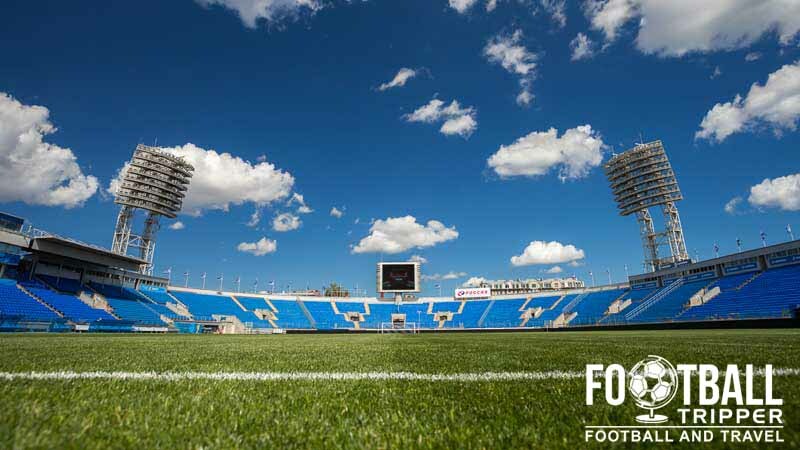 With Russia awarded the 2018 World Cup long term tenants Zenit are unlikely to play football at the ageing ground much longer with the club using the opportunity to construct a brand ground in partnership with the local council known as “New Zenit Stadium. Set to open in 2016 at a cost of approximately $1.1 billion, the new 66,881 capacity arena will reportedly be known as the Gazprom Arena after the Russian gas company purchased the naming rights. Petrovsky Stadium is comprised of four stands: North, East, South and West. Officially registered as FC Zenit in 1936, the club are the third most successful in Russia’s modern era since the creation of the Russian Premier League. Purchased by the owners of Gazprom in December 2005, the club has had significant investment and three years later were crowned the winners of the 2007/2009 UEFA Cup. Defeating Glasgow Rangers 2-0 in the final held at The Etihad Stadium, the confident Russians took their good form against British teams and defeated Manchester United in the subsequent UEFA Super Cup held at Stade Louis II in Monaco. Now focusing on the Champions League, Zenit are said to highlight qualification from the group stages as one of the objectives each season. 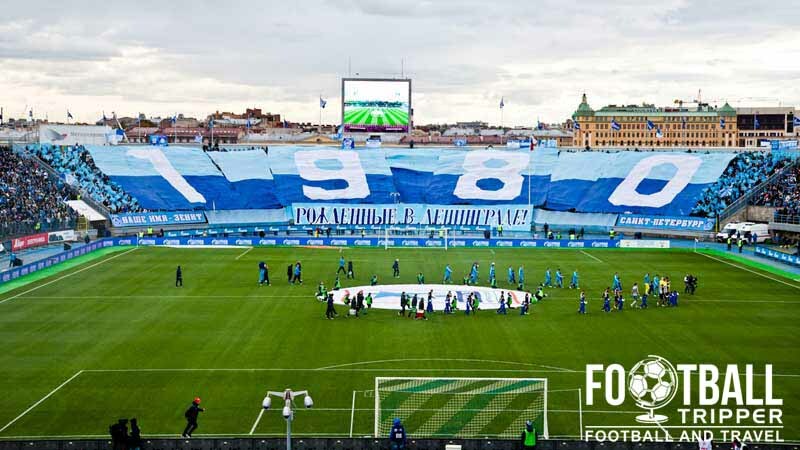 Zenit St Petersburg supporters showing of their teams blue, light blue and white colours. 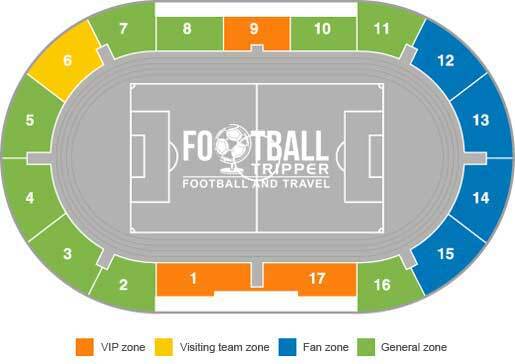 Away fans are usually housed in the north-east corner of the stadium in section 6 which is clearly marked out on the seating plan above through its distinctive yellow colour. This section of the ground can officially accommodate up to 1,284 supporters per match. Most fans drink before hand in the city centre however there is a bar located outside section 1 which sells beer and fast food. Known as “Foot Burger” the outlet is well priced, popular on matchdays and even open doing European matches. Zenit St Petersburg operate several stores throughout the city with the most popular one being at Petrovsky Stadium itself. As it’s only really practical to travel there when there’s a football match on for most people, many fans choose to shop at the online Zenit store. If the tour situated changes at the Petrovsky, we’ll be sure to update this section. In the meantime you could always check out Zenit’s virtual museum which is a pretty cool way of showing of the club’s trophies and memorabilia. 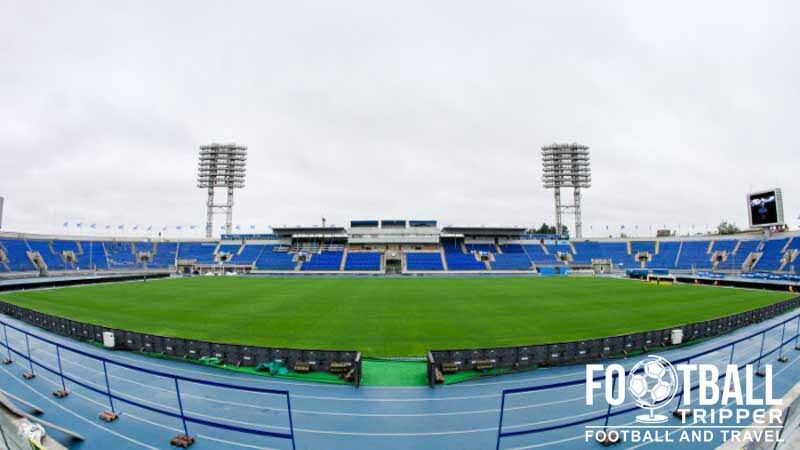 Tickets to see Zenit in action at the Petrovsky can either be purchased online or in person at the ticket office in the days leading up to the match as well as before kick-off. Petrovsky Stadium is located approximately 4.5km north-west of Saint Petersburg’s historic centre (Tsentralny District) within the Petrograd district on an island on the Malaya Neva River. Situated on Petrovsky Island Zenit’s stadium is an icy fortress with this never more evident than during the winter months. It can be walked to in just under 50 minutes however there catching the subway/metro is probably easier for most people. The largest railway terminal in Saint Petersburg is known as Moskovsky vokzal (Moscow Station), however at 6km away it is not very well placed with regards to Petrovsky Stadium. “Sportivnaya” which sits on the purple line five is the closest metro station to Petrovsky stadium. Located less a few metres across the island, you can easily hop on line five from the city centre at the “Sadovaya” where it is the second stop. For a complete list of metro lines and subway routes check out the SP Metro on Wikipedia. A few hundred metres south of the metro station on pr. Dobrolyubova there is the tram stop “Stantsiya metro Sportivnaya” which can be reached via tram numbers 6 and 40. There are two bus stops on the north and eastern sides of the stadium which are served by Blue buses 1 and 9, and Yellow bus routes K175 and K298. The interior of Sportivnaya Metro station is really futuristic with a minimalist asethetic. It first opened in 1997, and the second floor exit leads you out to the side of the Petrovsky Stadium. Parking is not advised because there are no car parks within the Petrovsky Stadium sports complex or within the adjacent residential area. Pulkovo Airport sits 20km south of the city centre, and is the main International Airport of Saint Petersburg, however some budget airlines advertise flights to Lappeenranta Airport in Finland which is MILES away! There is a fantastic range of accommodation options to suit all budgets 2.5km south back towards the centre of St. Petersburg. Reasonably priced options include the Aston, M-Hotel and Demidov Bridget to name but three examples.